Customize this private guided tour of Shanghai by picking two to three attractions to visit. On the half-day tour you can either follow a suggested itinerary or choose based on your interests. Attractions include the well-preserved Yuyuan Garden, the Bund or Riverside Promenade (Binjiang Da Dao) with skyline views, the French quarter, and more. We visited the Jade Buddha Temple, Gu Garden and Xin Tian Di French concession. Lunch we ate Shanghai local food, so good. Our guide Snow she is very helpful and knowledgeable. We all enjoyed the tour. We will highly recommend this tour and snow. Our guide Wilson was amazing, very helpful and flexible. He and our driver modified their schedule to pick us up early when our flight was early, and worked hard to make sure we had a good time. We would definitely recommend this team. Five stars!!! Very interesting guide snow with great knowledge of Shanghai. We visited Jade Buddha temple and Yu garden. Snow has a wonderful happy personality. We all enjoy the tour. We will highly recommend snow and this tour. I enjoy the trip today, the guide - Queena came on time and quite helpful with my itinerary. We went to see the Jade Buddha Temple, her knowledge about temple is quite amazing. I was asking her to take me to Sinan Mansion and Shanghai Jewish Refugees Museum. In my surprise, she can squeeze all the itinerary in 4 hours including the must go places like Yuyuan Garden and the Bund, and still manage to have a walk around neighborhood and have a good insight on Shanghai History. Good tour guide and talented photographer. 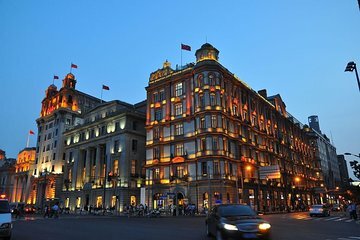 Totally recommended for first timer to Shanghai who doesn’t care go for shopping. Alana was an excellent and charming guide. We had a fantastic tour of Shanghai. Her knowledge of the places we visited was excellent and we would highly recommend her to anyone visiting Shanghai. Alana was an amazing host and tour guide. She went above and beyond our expectations during a rainy day to make sure our sightseeing was fully enjoyable. Her knowledge of Shanghai was exceptional. The extras provided such as the coffee stop was really appreciated too. Our driver was also very considerate and drove safely making us feel very comfortable. Great tour! Highly recommend! We had an amazing day with our guide Snow. It was very interesting and we saw a lot. Also the dumplings at Yang place were very delicious. We recommend Snow as the best guide and would book her again for sure! We picked this half day tour so we could maximize our limited time in Shanghai. Snow was amazing and really heard our wishes to get as much in as possible while still getting to experience the feeling of local Shanghai. She was so helpful getting tickets and picking a local place to have lunch (the dumplings were so awesome). I would very much recommend picking this tour for anybody that wants to pack a lot into a short period of time. Would use Snow again anytime! This was my first tour in Shanghai and Alana was amazing! I had limited time and she made sure I saw the three sites I wanted to see. She also took me to get some delicious lunch and was very knowledgeable about each location. Not to forget, Alana took the best photos in very scenic spots! Definitely would recommend this tour guide to anyone. Alana is the best you could ever hope for in a tour guide. Professional, kind, and even helps you bargains prices way, way down when shopping. No pressure to do anything except what you want to do. She even brought a spare umbrella for me since I didn’t think about it. Also, she bought me a coffee which is another nice touch. She knows all the history behind Shanghai and the buildings. She is very, very good at her job. I was picked up and dropped off right at my hotel. 5 starts from me.